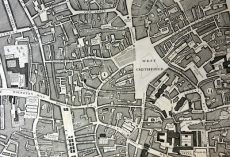 Under the terms of Humphrey Chetham’s will the sum of £200 was allocated for the provision of five small libraries, designed to be chained and housed in wooden chests. These were to be placed in the parish churches of Manchester and Bolton and in the parochial chapelries of Gorton, Turton and Walmsley. The library at Gorton was the first of the five libraries to be completed. Costing nearly £33, it contains fifty-one works of Bible commentary, sermons and religious writing. Chetham’s governors were instructed to purchase ‘godly Englishe Bookes … for the edification of the common people’. As was still common practice at the time, the books were shelved with the fore-edge rather than the spine facing outwards, to prevent the chains from rubbing against the bindings. Of the five original libraries, only two have survived, those of Gorton and Turton. The Manchester library was dispersed about 1830, the books ending up at second-hand bookstalls in nearby Shudehill. 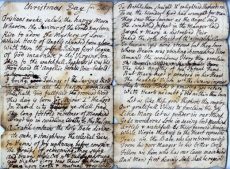 A number of the books belonging to the Bolton library are to be found in a chained library given by James Lever to Bolton School in 1694. The library intended for Walmsley was never completed. 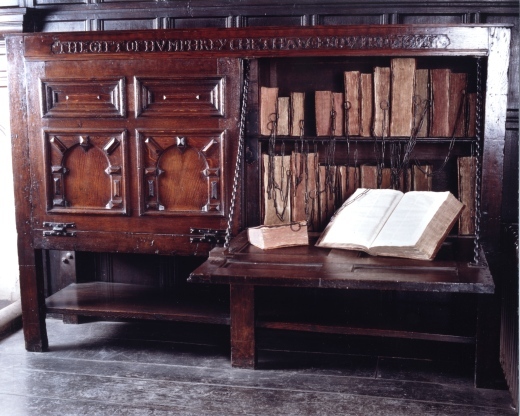 In 1984 the chained library of Gorton was placed in Chetham’s Library on permanent loan and was bought outright with the help of a Lottery grant in 2001.